The swing weight of a bat is determined by how difficult it is to swing. This is a physics principle that uses the length, actual weight, balance point and a pendulum period to calculate. It is not the same as, nor very well correlated with, the drop of a bat. 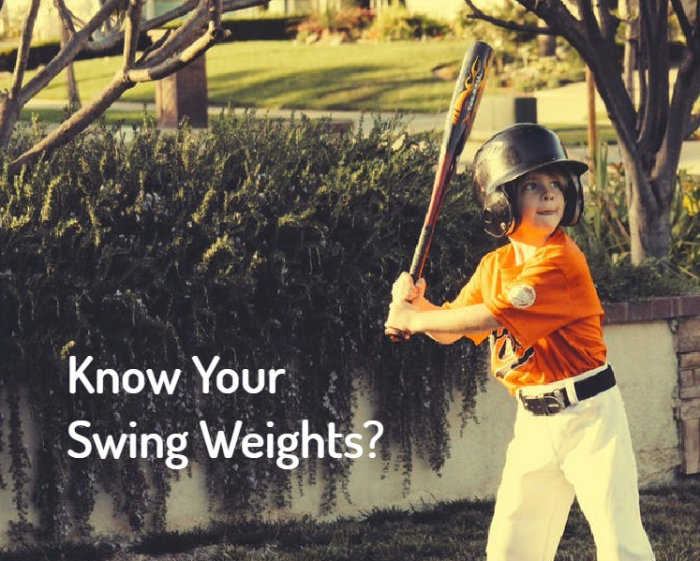 The swing weight is the only way to determine what bat swings heavier than another. We took every 2018 USA Baseball bat we could find and measured it swing weight with proper equipment. The industry currently uses drops as their categorization system but that is far from a useful metric when deciding between bats. We share the full list of USA Bat Swing weights below. >>>>>>>>See our BBCOR Swing Weights and our USSSA BPF 1.15 Swing weights page. Also, you might like our full line of USABat Reviews. How to Understand the Above Numbers? In short, and as an example, our measurements showed that the DeMarini Voodoo Balanced swings 5% heavier than the DeMarini Voodoo One. This is represented by a 1.05 in the numbers above. The ease at which a player can swing a bat is not very well correlated to the bats total weight and, as such, a bat’s drop is simply not nearly as important as most think. You might also like our Baseball Bat Reviews and/or our USABat reviews. Insight #1: Choosing a bat by weight is likely a mistake. We measured the swing weight on every 2018 31-inch USABat we could find. We found, as suspected, that ACTUAL weight is not very correlated with swing weight. That is, the actual weight of a bat is not a good indication of how difficult it is to swing. Notice in our chart, for example, a player might think the DeMarini Voodoo One in a 31/21 too heavy a bat and, instead, opt for the 618 Solo or the Hyperlite in a 31/20. But, they’d find the swing weight is actually the same in each regardless of the stated weight and drop. The problem exists on the opposite side of the spectrum too. Notice how a 31/20 Velo in the USABat has slightly higher swing weight than the 31/21 Louisville Slugger 718 Select. Buying a drop 11 Velo in hopes it will swing lighter than a bat like the 718 Select is a mistake. As a general rule for the chart, as bats move to the right along the x-axis (increasing actual weight) they do not necessarily increase up the y-axis (swing weight). Insight #2: Drops are dumb, but as long as marketing departments think you are too, don’t expect any change. The drop is the numerical difference between the length of the bat in inches and the weight of the bat in ounces. So, a 31 inch bat with a drop 10 should weigh 21 ounces. And, sure enough, any drop 10 bat in a 31 inch length will state it also weighs 21 ounces. As we’ve documented elsewhere, bats rarely are true to their stated weight and often run an ounce or two over. Drops, if we think about it for a second, are just another way to identify the stated weight of a bat. But, as we pointed out in Insight #1, the weight of a bat has little to do with how difficult a bat is to swing making, therefore, drops pretty useless. So, why publish and categorize bats by drop weight at all? Its a fair question that the industry has yet to really answer. Granted, much of the standard testing require bats to be within a certain “drop” weight. BBCOR, for example, must not exceed a drop 3 and their actual weight is a consideration in passing the test. But, in terms of a bats efficacy and ultimate usefulness to a player, the drop means nearly nothing. This is confirmed by the range in swing weights we document for so called “drop 10” USABat 2018 Bats. Insight #3: Comparing the percentage change in MOI among similar bats makes for an interesting list. The most useful way to consider the drop 10 USABats for 2018 is in a percentage based list. Since, among other things, a 6500 MOI does not mean much intrinsically. 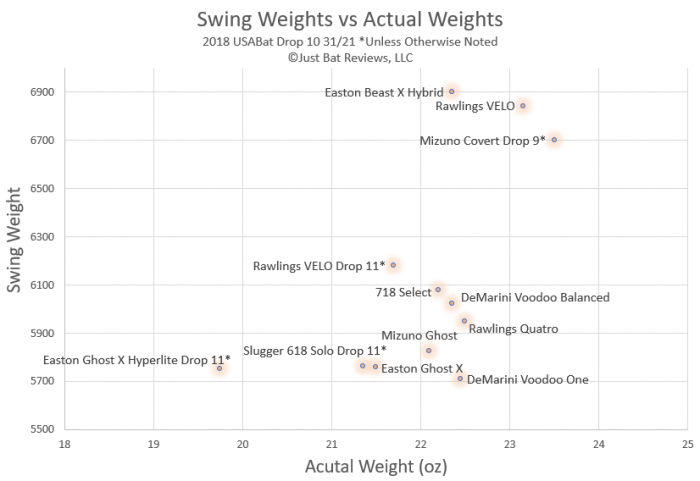 So, if we make the DeMarin Voodoo One as the easiest swinging USABat in a 31 inch in 2018 (which it is) and assign it a value of 1, what does every other bat feel like on the swing? These numbers should give you a good indication of how much more difficult it is to swing the bat. This model could work industry wide. We are hopeful the industry will soon rally around a swing weight system that will give consumers an ability to transfer one bat’s swing weight to another brand and model. Until then, we are left to the lab at Just Bat Reviews which is terribly limited by resources and time. Assigning the Voodoo One a value of 1 on a swing index and then presenting the percentage change of all the other USABats in a 31 inch will be instructive. A bat with a 1.50, for example, should be 50% more difficult to swing. We would consider bats 1 through 6 a hand loaded or speed loaded bat. Bats 7, 8 and 9 are balanced and anything over that is an end loaded bat. We would argue the Velo and Beast X Hybrid should have been categorized as drop 9s. But, to our original point, the drops in bats are dumb. And with the new USABat standard a bit of a guess for everyone we suspect we will see more convergence of swing weights as the next years come. What about the Rawlings Threat? Have you completed swing weights for 2019 USA bats? Yes. They are found on our exit speed pages that you can buy access to. At some point in the next week or so we’ll put much of that data on this page. Thanks for the reminder! For some reason I cannot subscribe to see the results…. Tried email… Facebook…. And Google…..it hates me…. I hope this stays updated as the newer bats get tested. I’d also like to view it. Would it be possible to include Axe bats, specifically Axe Element and Axe Origin to the list? Thanks. 1) The beast X Drop 10 30/20 has a 5100 MOI (or thereabouts). So, in other words, you can expect it to be “balanced” like the other ones on this list. In theory, every bat manufacturer changes their swing weight by about 10% from inch to inch. Making, therefore, the 28 Beast X similar to where the 31 lands in respect to other bats. But, in practice, no one has yet measured all the swing weights of every bat to confirm. We have tried but our budget limits us to not buy every bat in every size, just every bat. Anyways, hope that helps.